As she begins her studies at Stanford University this week, Amy Frohnmayer ponders the usual freshman worries: What should I major in? Will I get along with my roommate? How will I find all my classes? Eighteen-year-old Amy has Fanconi anemia, a rare genetic disease that killed both her sisters. The illness brings a high risk for cancers and hampers the formation of blood cells, leading to anemia, fatigue, infection and bleeding. A bone marrow transplant doesn't change the cancer risk, but it can fix the blood problems, stretching life expectancy beyond the usual 20 years. But there's a catch: This particular transplant works best when patients are fairly healthy, before they develop leukemia or severe infections. It also leads to the death of more than a quarter of patients, making it wise to delay as long as possible. "I actually was going to have a transplant instead of going to school this fall," she said at her home in Eugene, as she prepared to leave for college. But "I'm so healthy now, and starting school, I just wanted to get on with my life. "I'm getting used to the idea that it's up in the air, and someday I'm going to have to do something . . . But that's life. It's random and unexpected." For Amy, life is a mix of wonderful possibilities leavened with the certainty of hard times ahead. In one sense, she said, she's no different from others: A traffic accident could cut short any life on any day. But Fanconi anemia amplifies that, offering keener awareness of life's joys while forcing early, often public, experience with sickness and death. The Frohnmayer family has dealt with the disease since before Amy's birth. Her oldest sister, Kirsten, was diagnosed in 1983 at age 10. Her other sister, Katie, also had the illness. Her father, David, now president of the University of Oregon, dropped out of the governor's race in 1986 to help care for the girls. Their mother, Lynn, quit her state children's services job to do the same. Neither of the Frohnmayers' sons, who don't have Fanconi anemia, was a bone marrow match. Before Amy's birth, the family hoped she could be a compatible donor. She was a perfect match for Katie. But tests just after Amy's birth showed she had Fanconi anemia. That meant she could not be a donor but would need one, too. Katie Frohnmayer died in 1991 at age 12. 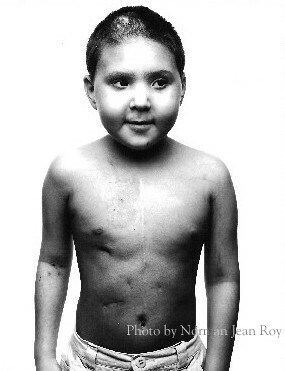 Kirsten Frohnmayer died in 1997, two years after a transplant from a mismatched donor, and two years after getting her bachelor's degree from Stanford. "Having my two sisters die has been very painful," Amy said. "But it's also given me an appreciation for what I have. It just reinforces that life is so fleeting, and we are lucky to be here and have the people we have in life." Amy is healthier, at her age, than either of her sisters were. She has not yet had a major health problem. When she does, and needs a transplant, the family has identified a potential donor who is a 70 percent match. And the fund, at Lynn Frohnmayer's urging, sponsored research into a drug that has improved the success of such mismatched bone marrow donations to perhaps 70 percent, more than double the previous success rate. Those odds spurred the Frohnmayers to New York to ask a doctor about a transplant this year. The doctor saw Amy's robust health and busy life, and advised the family to hold off. "He said, 'Do you really want to do this?' " her mother recalls. " 'Yes, her chances are 70 percent. But what I want you to hear is, it's only 70 percent.' "
So the family is waiting, looking for signs of troubling mutations in Amy's blood cells. She'll have blood drawn every six weeks at Stanford and have bone marrow tests in Portland every six months. In the meantime, she'll continue taking only a small dose of medicine to boost her blood counts. "I have lots of energy. I feel good. I feel healthy," she said. "The bottom line is, I'm extremely lucky." In high school, Amy packed her schedule with activity. She took courses to earn her International Baccalaureate diploma, took part in the Model United Nations and was an officer in student government. She played on the tennis team and helped found the girls cross country ski team. Amy volunteers with Courageous Kids, a group that helps children deal with grief and death. Members started mailing her after her sisters died. But Amy didn't go to meetings then. She wasn't sure about public grief, shied away from counseling or support groups and felt she had to be strong for her parents. Grief, she said, is taboo in American culture -- a topic she explored in a high school research project. She said she may want to work with grieving children after college, perhaps becoming a social worker like her mother. It's a path Lynn Frohnmayer can picture. "Amy is one of the most sensitive and caring and genuinely, deeply kind and compassionate youngsters I have ever known," her mother said. "Maybe that compassion, in part, grows out of what she had to experience and endure, but there's more than that. She got this dreadful FA gene. But she got a gene for compassion, too." Social work will have lots of competition at school. Amy has a long list of competing interests: psychology, poetry, literature, Spanish and international relations. She wants to study abroad in a Spanish-speaking country. She is excited about the diverse student body at Stanford -- which includes her brother John, a junior there. Picking Stanford, she adds, is no criticism of her father's college: "I didn't consider Oregon, but not because I don't think it's a great school. I do. But for me, part of the college experience is about getting out and being away." But even as she leaves, Amy expects to find her way back to Oregon. She's already considering what she'll miss: grabbing a plate of pad Thai at Eugene's Saturday Market, hanging out with friends on 13th Street, hiking Mount Pisgah, getting frozen yogurt with her mom at a shop near their home. Her parents, too, will have plenty to miss. For the first time since Kirsten's birth in 1973, there will be no kids living at home. "I'm not looking forward to this at all," Lynn Frohnmayer said. "The bottom line is, she is my dear friend. She is a treasured companion. I love spending time with Amy. I'm going to have a bit of a tough adjustment." Remember how we went to Disney World with Make-A-Wish. Well, check out this girl's wish. She has FA, too. Though she could never hold a rifle by herself due to illness, 14-year-old Samantha Baber was able to shoot a black bear with help from several area hunters. Through the Pittsville-based United Special Sportsmen Alliance, which organizes hunting or fishing trips for terminally ill or disabled people, Samantha and her parents, David and Theresa Baber of Wallingford, Ky., traveled to northern Wisconsin last week. Samantha has had two bone marrow transplants to combat Fanconi's anemia, a rare and terminal genetic disorder that leads to progressive, severe bone marrow failure, said USSA president Brigid O'Donoghue. Lee McDonald of Pittsville was among a group of about 30 hunters from Pittsville, Neillsville, Marshfield and Collettsville, N.C., who volunteered to help Samantha hunt for bears in the Chequamegon National Forest. After arriving at the hunting cabin near Fifield where they stayed Sept. 11, Samantha rode along with a group of hunters to check bear bait piles, McDonald said. While rechecking the baits Sept. 12, McDonald said the group found a pile that had been disturbed by a bear. Samantha and the hunters chased one bear for about six hours before it finally outran the dogs, McDonald said. Early Sept. 13, the hunters found another disturbed bait site and started the chase. Eventually another hunting party called Samantha's group to report they had chased a bear up into a tree. The bear climbed in and out of four trees before the hunting dogs managed to catch the bear on the ground, McDonald said. Then McDonald carried Samantha within 20 yards of the bear so she could pull the trigger. "After she got to shoot the bear, the smile on her face was priceless," he said. Philan Susa of Neillsville donated her bear hunting tag to Samantha, and her son, Randy Susa, was among those who helped hunt the bear. "I couldn't believe how nice everybody was and what they did," said David, Samantha's father. "We were all real proud of her." Samantha has always loved the outdoors, David said. "She loves deer hunting, turkey hunting and fishing," he said. "This is the first time she's been bear hunting. She really loved it." At first Samantha wanted a rug made out of her bear, but after the hunters took up a collection, and a Fifield taxidermist donated his time, McDonald said he'll be able to deliver the bear to her home fully mounted. "That was really something that they'd do that for her," David said. O'Donoghue said she met Samantha after her successful hunt. "I could tell she was really happy," she said. "That's what we want to see - the joy in their face like that. It's worth a million bucks." The USSA has already fulfilled 600 hunting and fishing wishes this year, and O'Donoghue hopes to reach the 1,500 mark. O'Donoghue said she's seeking more children who could benefit from the organization, because there's an abundance of donated hunts and fishing trips available. Mom freaked out the other day. She couldn't find a copy of the great photo of you in the Batman costume that we use for everything, like the Hope for Henry Foundation brochure. She finally found some copies but not being able to find one for so long really made her very sad. She told me that one of the things making her sad was how the photos of you are only getting older and we'll never have any new ones. I was listening to this song the other day and of course I thought of you. The cape, the courage -- except you only made it to seven. Joe started school last week. Mom and I don't cry like we used to. Actually it is pretty uneventful. We bring Joe and Jack to school, give them a big kiss and walk away. We have been lucky that none of you ever made a big fuss or wouldn't let us go. I am happy that Joe is following in your footsteps. He is in the Square class. Elaine is his teacher. I think they'll love each other the way you and Elaine loved each other. At first when we told Joe that he was going to be a Square he said he didn't want to go to school. Mom, of course, got to the bottom of that. It seems that Joe didn't want to be a Square because he was afraid that they wouldn't have the same kind of snacks that he had when he was a Rainbow. When Mom told him that there would be cinnamon graham crackers he came around. Then Elaine visited and she and Joe played and that sealed the deal. I am really proud of Jack. He is really enjoying baseball. He had a game on Saturday that felt like a roller coaster. He hit what looked like a home run, but because the ball finally rolled into the street, they said it was only a double. 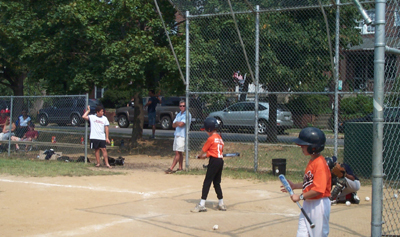 But as you know, we play that if you hit the ball from the porch and goes into Calvert Street, then it is a home run. Too bad the rules change a half a block away. Joe and I played together on the side of the field. He kept hitting the ball to me. He can also throw really well. Look out for him. He is more of a natural athlete, like you, and Jack is more like me -- which means he has to try a lot harder. That is why I am so proud of him. He is trying really hard. Once upon a time, there was a little league baseball team. When they were good, they were very good. But when they were bad . . . well, I’m sure you get the idea. The Orioles must have felt like they were living in a fairy tale on Saturday. Like Cinderella at the Ball, the Orioles waltzed though the first five innings on glass slippers, enjoying a 9-4 lead based on timely hitting and several nice defensive plays. But like Snow White, the Orioles couldn’t resist tasting the apple of complacency. By the time they awoke from their slumber, the clock had long since chimed midnight, their victory carriage had turned into a pumpkin, and the Orioles were feeling very Grimm indeed. Both teams struggled to score until the Orioles struck for three runs in the bottom of the fourth inning. Sophia broke out of an 0-3 slump in a big way by smacking a solo home run to open the inning. Jack Goldberg followed with a single, and scored on Eva Monroe’s double. Unfortunately, Eva was tagged out in a rather bizarre play resulting from a miscommunication with the coaching staff. All the more unfortunate, since Evan Hamlin followed with another home run. Although the Orioles gave up four runs in the top of the fourth inning, they batted around in the bottom of the fourth, scoring six more runs and extending their lead to 9-4. Harris Rothman started the rally with a home run. Consecutive singles by Ian Ludwig, Benji Satloff, and Jack Price followed an Ari Moskowitz double. Sophia Abshire then belted a double up the middle, and came around to score on Jack Goldberg’s ground-rule double (which would have been a home run had it not gone out of play). Eva Monroe and Evan Hamlin singled to finish out the inning. After a scoreless fifth inning, the Orioles seemed confident of victory, with a 9-4 lead and the bottom of the Pirate order coming up. Perhaps too confident . . . Before the Orioles could finish counting their proverbial chickens, the Pirates mounted a furious rally. Sprinkling a few well-hit balls amidst a series of Oriole misadventures, the Pirates pushed across seven runs to turn a 9-4 deficit into an 11-9 advantage. The stunned Orioles could not answer in the bottom of the sixth, and the game was lost. 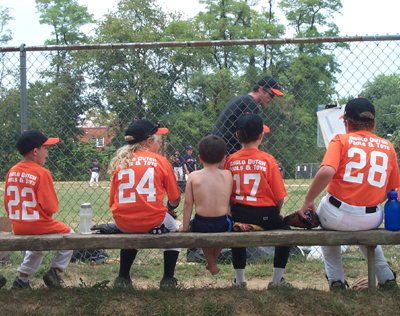 The Orioles were obviously not short of offense – Sophia, Jack G., Evan and Eva were all perfect at the plate. Ian, Ari and Harris also had multi-hit games. Although base running errors cost the Orioles a couple of runs, the real story was the Orioles defense, or lack thereof. There were, to be sure, some great defensive plays. Ian’s short-hop, unassisted putout at second comes to mind. Evan’s swipe tag on a runner trying to take second base was another nice play (by the way, nice throw Harris!). David Lane was, as usual, making plays all over the field. (By the way, we all know David is one tough kid, but seriously, we will have to talk about the practice of using one’s face to stop the ball, a technique I understand is not recommended by 9 out of 10 dentists). But on the whole, the Orioles failed to play the kind of heads-up defense they are capable of playing. And we should not forget to give credit where it is due -- the Pirates, played hard and made the plays when it counted. They deserved to win. The Orioles do know how to catch, or at least stop, the ball. They do know how to stop the runners. They know what a cut-off person is, and why it is important to throw the ball to the cutoff. They know how to play together as a team and to help each other out. What they have to learn is that you have to do all those things for the entire game. While it may be true, as a great philosopher once said, that two out of three ain’t bad, it is an unfortunate truth that (at least in baseball) five out six ain’t good. Rome wasn’t built in a day. A journey of a thousand miles begins with the first step. [INSERT YOUR OWN CLICHÉ HERE.] We have much to practice, and so we shall, on Thursday at 5:00 p.m., Stoddert Field. The stats for the first two games are attached. Jack is playing Northwest Little League. He is on a team with Ari, Benji and David. The great thing is that the games are a hop, skip and jump away at Stoddert. It is nice to be able to go home and grab some water or go to the bathroom in the middle of a game. The Orioles are pretty good. They, mostly Jack (No. 17), have a big fan. This is Jack up at bat. So when I saw Ari, he said "You look just like Henry." I have to look back in this because I think he has said that before. Maybe he is just saying that to be nice because I don't think that you and I look anything alike. Whatever the reason, it is the nicest thing anyone could say. Another nice thing someone (a friend) said to me the other day is that she wanted her grandson to be like me when he grows up. I think I once said that I want to be like you when I grow up. So I guess she was saying she wants her grandson to be like Henry Strongin Goldberg when he gets older. That's a good thing to be.